NVIDIA continues with its aggressive launch of Pascal with the announcement of its new wave of notebook GPUs, the GTX 1080, 1070 and 1060. With promises of desktop level performance from a notebook part, NVIDIA is pushing hard for high performance solutions that are VR-Ready and 120 FPS capable. Somewhere in the middle of the British countryside, a place better known for its horse racing than tech events, NVIDIA showcased its latest Pascal architecture on a new platform, the humble laptop. With boosts in power efficiency, more TFLOPS than you know what to do with, 120 FPS+ gaming, 4K, G-Sync, and fully immersive VR experiences, the latest mobile-based GPUs are aiming high. The speed with which NVIDIA is coming out with its new platforms is extremely aggressive, and something we are not used to seeing. Most architecture launches are spread out over 6-12 months, with new parts coming forward every month or so. Here is NVIDIA release the new TITAN X, GTX 1080, 1070, 1060, Tesla P100, the Quadro P6000 and P5000, and now the new mobile GPUs, all in the space of 3 months – and we still have more to come. The new mobile GPUs being announced today are the 1080, 1070 and the 1060,and they do come with a subtle, but significant change to the naming, and that’s the lack of M. No 1080M or 1070M here, in fact, the chips themselves are very similar to the desktop counterparts – which makes explaining the differences very confusing, especially when they all have the same names. Kind of like the the new TITAN X and the old TITAN X.
NVIDIA… What’s going on with the confusing names? For those that can’t easily spot the differences, it basically comes down to a simple deduction in the core clock speed on the notebook parts – however, the surprise is the GTX 1070; the notebook part has more cores than the desktop. Even if the clock speed is lower, it’s quite possible the 1070 notebook chip will likely perform better than the desktop version. When compared to the last generation Maxwell M-based chips, the gap becomes huge. More than a 50% increase in core speed, and nearly double the number of cores, the Pascal mobile parts are likely to see performance increases of 70% or more. The notebook parts seem to have the performance, but it takes more than that to be competitive in the notebook market, and NVIDIA have also updated, enhanced and added extra features to make these systems more desirable. As such, we’ll be looking at a number of additional features that appear in these new notebooks, as well as the target markets. When a notebook GPU has this much performance, simple 1080p gaming isn’t going to be enough. One of the keynotes mentioned at this release was NVIDIA’s dedication to VR, even in the mobile market. With effectively desktop GPUs in a notebook, the new GTX 10-series chips are pushing beyond the typical 1080p resolution, and are moving into 120Hz displays, G-Sync, 2560×1440, and VR headsets. If your budget can afford it, 4K is possible too with the GTX 1080. During the demo session, a number of notebooks were setup with an HTC Vive, playing games at silky-smooth 90 FPS+, even with the little GTX 1060 GPU. While the graphics in something like RAW DATA are not exactly AAA by modern standards, being able to play such a game on a notebook lag free, was quite impressive. The mobility afforded by a laptop capable of VR can not be overstated, as it frees up a lot more space, something that would be very useful when AR takes off. If you can’t afford the rather steep cost of entry for something like the HTC Vive or Oculus Rift, then perhaps twitch-reflex 120Hz displays with G-Sync are more your thing. While 60Hz is the goal for most games, there are occasions where going over can be problematic, so V-Sync is enabled to prevent tearing – but this introduces lag, as frames can be dropped (introducing stutter) in order to maintain a fixed frame rate. At the same time, stutter can creep in when the frame and monitor refresh don’t sync up, meaning a frame can be sent but not shown because the display has already refreshed – this is what G-Sync solves, by matching the frame and the monitor refresh. Both 120Hz and G-Sync are supported at the same time with the Pascal GPUs, but it will be up to the manufacturer to implement a compatible display. In the same demo session, a number of notebooks were setup with a variety of games, each with different GPUs and settings. When you see a little notebook chucking out 150 FPS+ at 1080p in Doom with Vulkan enabled and all settings maxed out with no screen tearing, it just cements how over-powered these GPUs are for classic gaming. Overwatch was equally amusing when you see it being played at 4K with over 80 FPS. If that wasn’t enough of a hint, yes, there will be 4K G-Sync enabled displays from select manufacturers. With all that digital pony power at your beck and call, it becomes even more amusing when NVIDIA starts putting its cards on the table with the inclusion of overclocking. Intel’s latest high-end Skylake CPUs in laptops and notebooks, also set a trend for manufacturers to allow overclocking of the CPU, and to some extent, the GPU too. Now NVIDIA is pushing things further with aggressive design implementations and improvements to the power delivery systems. Dual-FET power supplies increase the stability of power delivery, and the multi-phase supply increases efficiencies, letting the chips pull more power without wasting it to heat. 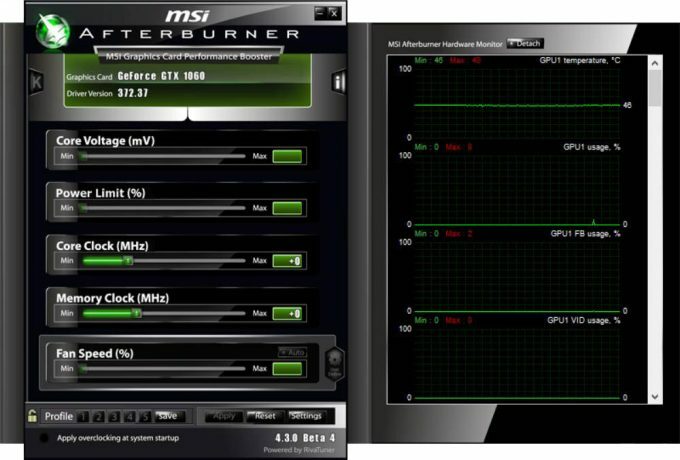 Cooler chips, more performance, greater stability, its just what’s needed to push up to a 300MHz overclock or more on the GPU, but with the right thermal design, it should be possible to safely get +200MHz, or a total of nearly 2GHz boost. This overclocking was showcased at the presentation after a couple false-starts, with Doom chugging along at a near-comical 200 FPS for a few select scenes (likely 1080p). The exact limits will be entirely down to the manufacturer, along with any warranties that may be in place. Some may even sell the notebook with a factory overclock, so keep that in mind when purchasing. Since we are dealing with notebooks here, the inevitable question of power will crop up, but let’s not kid ourselves here – these are more desktop replacements than notebooks. When the CPU and GPU can pull close to 200 watts total, even the largest battery is going to struggle to keep that kind of draw going for any extended time. With that in mind, there are some tricks that can be done to extend the life when performing under such extreme loads. 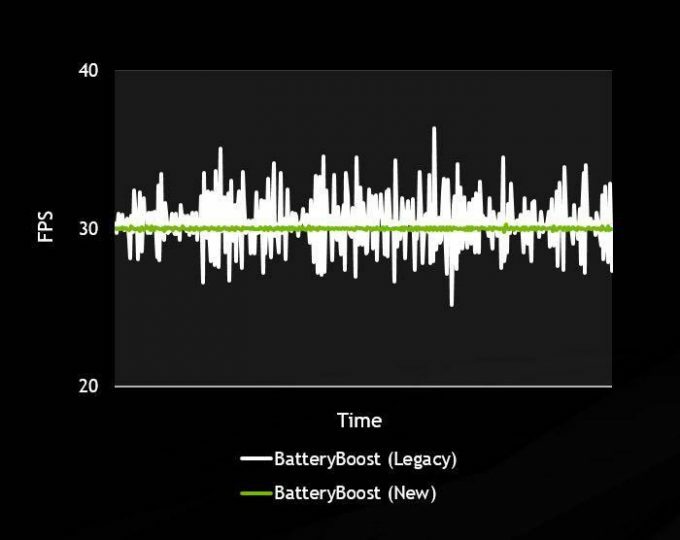 NVIDIA has included and updated its BatteryBoost technology that effectively targets a specific frame rate and tries to not render beyond that, wasting power in the process. It also employs clever sleep states and underclocking to achieve very linear frame rates, removing stutter as much as possible. This frame targeting is different to the likes of V-Sync, as it doesn’t drop frames, but delays the processing calls instead, meaning that frames are rendered on command, minimizing stutter in the process. Couple this with G-Sync, and things will appear silky smooth, or at least, that’s the idea (similar methods have been employed directly in games in the past). 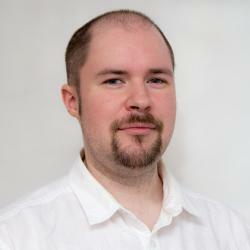 Frame rates can be limited to 30-60 FPS, or anywhere in between. BatteryBoost goes further to allow power profiles to be saved on a per-game basis, so you are not forced to a universal profile, much like how the OS handles options for battery mode. In total, BatteryBoost can increase the longevity of the system battery by up to 30%, while still letting you play games at reasonable rates. It does need to be stated that these are often best-case results, and some games may not play well with these limits enabled (we were warned that Metro: Last Light was a particular offender).